In the last three weeks there was about 2 meters of snow falling over London Ontario that caused the University to be closed for 4 days and the city buses not to operate for almost two days, due to the heavy load of snow on roads. How much this city became heavier then? With the area of almost 400 (km^2), so the volume of snow is 0.8 billion (m^3). The mass density of freshly fallen snow is around 10% of that of water, let let be it 100 (kg/m^3). 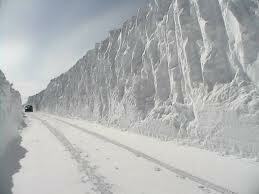 So the total mass of the snow is huge: 80 billions (kg). This is equal to the mass of a near-Earth asteroid that caused a brief period of concern in December 2004 because initial observations indicated a small probability that it would strike the Earth in the year 2029! How much power does this mass create? If we consider the speed of rain droplets is a few meters per second, let us consider the speed of snow is at least 0.1(m/s), which produces the kinetic energy 1/200 (J/kg). This much snow fell on the city in 4 days therefore the rate of falling was 80 billions kilograms per four days, or 200,000 kg/s. The total power is 1000 Watts. This snow generated 5% of the solar power radiated by sun over this city. Wowwww! we definitely were hit by the astroid!